Shredder pumps use a barbed or bladed impeller to tear apart solids with great rigor and little maintenance. Cutting action occurs only when solids are present, otherwise shredder pumps operate like submersible sewage pumps. 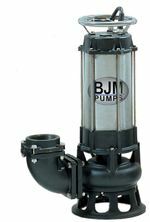 Applications include sewage pump stations, septic systems, campgrounds, basements, construction sites and other applications requiring the reduction of difficult solids. Pump Express customer service agents are standing by to provide technical assistance, price quotes or to answer any questions you may have regarding the shredder pumps we stock and sell. Call Our Toll Free Number 1-800-298-4100.